This truss bridge's design was started a decade ago when I received CITY set 7900 (Heavy Loader) for Christmas 2006. I loved the truss part's Technic-y design, but it didn't work with my original black and red trains, so I shelved the parts, hoping that someday reality would catch up with my dreams. After about 4 years, I designed a workable bridge using most of the parts of Bionicle set 8995 (Thornatus V9) which was purchased for the parts alone in 2010. It looked bad and wasn't tall enough for most of my trains, so I tore it apart in 2012. (you can see it in the LDD screenshot above) I kept sitting on the idea for another year and a half until 2014, when I designed this current bridge. This bridge was just finished in Real Life yesterday due to constantly tweaking the design and perpetually fearing it wouldn't work right. The model is five tracks long, but the bridge itself is four tracks. The reason for the extra track is to give the engines preparing to cross the bridge room to straighten out from curves / switches. I still have another two pieces of flex track (not shown) before the bridge as well for evening five tracks out to six.... it makes layout planning so much easier when (mostly) everything is in even numbers of track. The model is not able to be doubled up to make a two track wide bridge without significant modifications. The model can fit 8 studs wide trains with ease, and is tall enough to let all my trains (and most, if not all, of the official sets) through. The bridge is even strong enough to be carried by the top grid-work, as long as you don't swing it around / slam it down hard. Comments, Questions, & complaints are always welcome! Looks good. We're do those truss pieces come from? Height wise, can it handle the Maersk train's double stacked containers? I miss those pieces. I wish I got some back then, but I hated one big useless pieces, but they look so great in the bridge! Thanks. Those truss pieces come from set 7900. (link to the part on BL: http://alpha.bricklink.com/pages/clone/catalogitem.page?P=55767&idColor=86#T=C&C=86 ) i don't know about the Maersk. 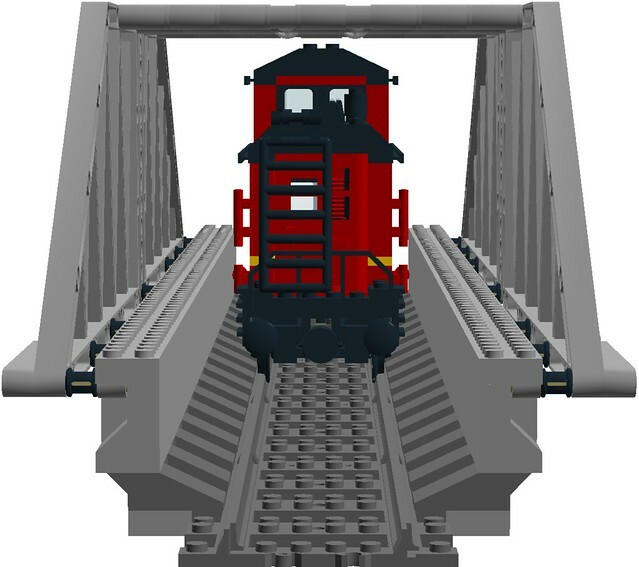 I know my 10014 caboose can fit by the top of the bridge with little room to spare, so if it's shorter than that, it fits. Here's my digital version of the height test. Thank you! I wish they were more common... this is one of those instances where big, single-use parts are actually needed! I remember the truck and it was kind of overpriced because I wanted just those pieces for a bridge, but talked myself out of them. They also worked great on the Exo-Force base in organ, which I also regret not buying when it was on clearance. I'd love if LEGO redid the pieces and made one for the straight section and one for angled piece, that would be awesome.